/ How To Keep A Bathroom Clean For Good! It’s proven that bathrooms carry some of the most germs. So How to keep a bathroom clean for good? We got six quick and easy tips to help you keep a bathroom clean for good. 1. 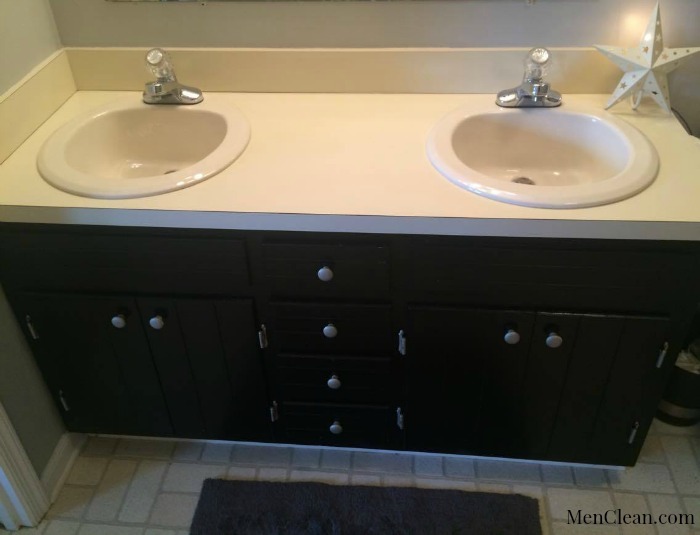 The first tip on how to keep a bathroom clean is it needs to stay organized, and you need to get into a routine. After you and the kids get ready for work and school pick up any clothing or towels from the floor and put them in the hamper or directly in the washer and start a load! 2. Clear off your faucets and counters. It will just take two minutes to put away toothbrushes, hair brushes, etc. Putting everything back where it belongs will save everyone time the next time they need it. Then tell everyone in the household if they use something put it back where they found it. Everything has a home! Doing this will help save time cleaning up in the future and this teaching your kids responsibilities. 3. Keep a trash can close. 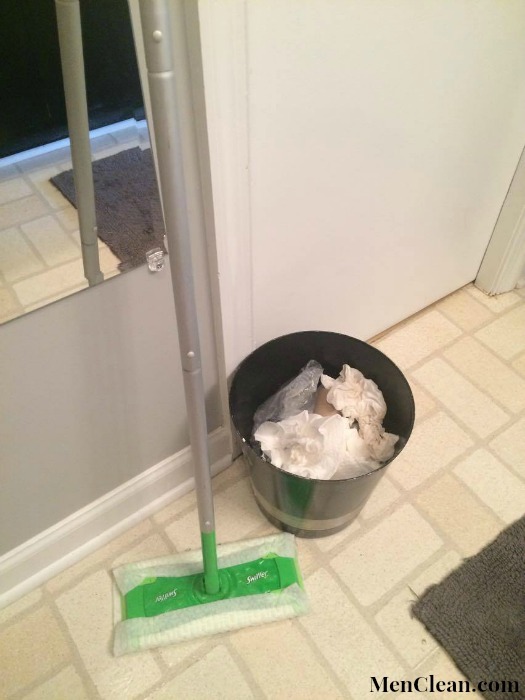 I love to keep a small trash pail in each bathroom, so little trash like, q-tips, tissues, etc., gets in pail rather than left on the counters, floors and saves time from having to go all the way to the kitchen downstairs. Again, I teach my kids to help out around the house and get them to empty the trash pails so they don’t fill up and overflow! 4. As you are RUSHING to get everything finished, just take 60 seconds to wipe everything down. I keep disinfectant wipes beside my toilet. Just grab two and I use one to wipe down the faucet and counters and the other to wipe down the toilet super quick. One thing that will help out is keeping your counters and top of cabinets clear. This will save you a lot of time when cleaning the counters and that way they are collecting dust either. 5. At least once a week, even if its the weekend wipe down the mirror, tub and floors. Keeping this up once a week will help keep your bathroom clean, and you won’t have to scrub the tub or shower because you have kept up with it! 6. Finally, Keep a duster nearby and as you leave the bathroom just do a quick sweep of the floors. No one likes coming home to a nasty bathroom with hair all of the floor tracking it throughout the house. 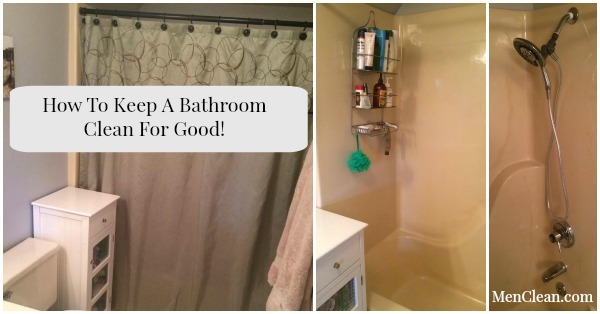 Keeping up with your bathroom will make it easier for you! Putting it off will only make it harder to clean and more time scrubbing which is no fun! If you have a wax ring in your toilet to keep the seal from leaking, Do not use the Automatic Toilet Cleaner disc that you can leave in the take. The harsh chemicals over time eat at it and will lose the seal, and it will begin to leak. I speak from experience and was told never to use them! The final tip is for the shower, keeping soaps, shampoos, razor and shaving cream cans off the tub and shower will ensure that you won’t have additional soap scum. Consider getting a shower caddy. Leaving razors and shaving cream cans in your shower or tub will leave rust stain marks which are hard to get off if left there for a long time. I hope these tips on how to keep a bathroom clean will help you and that they are easy enough to continue doing as a part of your daily routine!